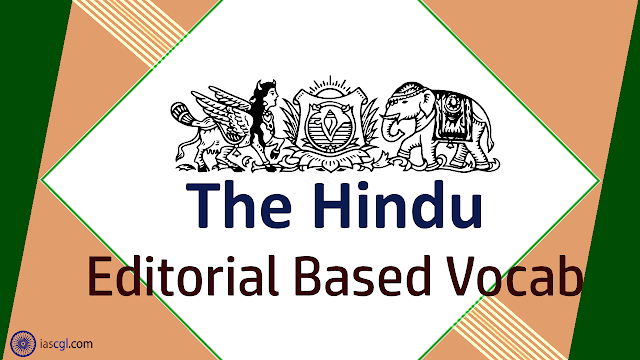 HomeVocabThe Hindu Vocab 11th September 2018 For Competitive Exams. The Hindu Vocab 11th September 2018 For Competitive Exams. Vocabulary from The Hindu Editorial 11th September 2018 for Staff Selection Commission(SSC) Combined Graduate Level, Combined Higher Secondary Level, Bank PO, Clerk and other state Government Examination. After failing to get the seven convicts in the Rajiv Gandhi assassination case released by exercising its statutory power to remit life sentences, the AIADMK government in Tamil Nadu has taken recourse to a possible constitutional remedy. It has decided to invoke the Governor’s clemency power under Article 161 of the Constitution. The earlier attempt in 2014 to remit the sentences under the provisions of the Code of Criminal Procedure was stayed by the Supreme Court, which ultimately held that the Centre had primacy in according remission to life convicts in a case that involves consultation between the Centre and the State. The Centre formally declined to concur with the State’s proposal in April 2018, saying it would “set a very dangerous precedent and lead to international ramifications”. There is no doubt that the sovereign clemency power vested in the President and the Governor is quite wide, but the Supreme Court has in the past cautioned against its use for political considerations. Tamil Nadu Governor Banwarilal Purohit will now have to take a call on the advice of the State’s Council of Ministers and decide whether he is bound by it. The moot question is whether he will pause to consider the Centre’s opinion against releasing those involved in a “diabolical plot” hatched by “a highly organised foreign terrorist organisation” and either reject the proposal or seek its reconsideration. In either case, he will be mindful of the fact that his decision will be subject to judicial review. The Tamil Nadu government believes there is no legal bar on the convicts getting the benefit of Article 161, even though the mercy petitions of some of them have been rejected by both the Governor and the President. But the issue has thrown up a number of questions that relate to process. For instance, what happens to the four Sri Lankan nationals among the convicts? Will they remain in India or be repatriated? Also, shouldn’t there be a case-by-case evaluation for releasing those sentenced for life? An omnibus order of release clearly will not address the particularities in each case, or evaluate the gravity of their role in the crime and the effect on society of releasing them. In principle, the idea that convicts who have suffered prolonged incarceration require compassion cannot be faulted. The idea of locking away a person for life, without so much as a sliver of hope of freedom, is not in keeping with the ideals of a truly modern society. However, it is impossible to ignore the impact of such a decision on capital punishment. When lifelong imprisonment is regarded as a humane alternative to capital punishment, releasing life convicts may only strengthen the demand for the imposition of the death penalty — which would be retrograde. Although there are many political considerations behind the move to release the convicts, this case must be decided on the basis of legal principles alone. Clemency: दया - mercy; lenience. Remit: छोड़ना -cancel or refrain from exacting or inflicting (a debt or punishment). Remission: क्षमा - the cancellation of a debt, charge, or penalty; forgiveness. Concur: मेल खाना -be of the same opinion; agree. Ramifications: असर - a consequence of an action or event, especially when complex or unwelcome. Diabolical: पैशाचिक ; शैतानी - belonging to or so evil as to recall the Devil. Plot: साजिश -secretly make plans to carry out (an illegal or harmful action). Hatched: रची - conspire to devise. Repatriated: प्रत्यावर्तित -send (someone) back to their own country. Omnibus: सर्वग्राही - comprising several items. Incarceration: क़ैद कर देना -the state of being confined in prison; imprisonment. Retrograde: पतित - directed or moving backward.